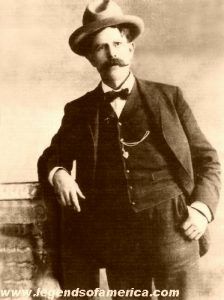 Joseph “Joe” S. LeFors (1865-1940) – Born in Paris, Texas in 1865, LeFors grew up to be a cowboy and after driving a herd to Wyoming in 1885, stayed there. Later he would become and inspector-detective responsible for tracking stolen cattle in Wyoming and Montana. In the process he was involved in a number of gunfights. In 1899, he rode with a posse sent to capture those responsible for the Willcox Train Robbery and was appointed as a U.S. Deputy Marshal the same year. In this capacity, he pursued a number of train robbers and other outlaws in the northwest. In 1901, he became famous for arresting and documenting a confession from the former lawman turned hired killer, Tom Horn. Horn was later tried, sentenced to die and hanged. In 1902, Lefors was working for the Iron Mountain Ranch Company in Helena, Montana, allegedly with the intention of infiltrating a gang of cattle rustlers. However, he was unsuccessful in aiding with the gang and was fired in 1904. Afterwards, little is known about his life, other than he died on October 1, 1940 and is buried in the Willow Grove Cemetery in Buffalo, Wyoming.